Inder Loves Folk Art: Flower child. Here's a simple little project I whipped up in a couple days: a little sundress for Maggie, using Simplicity 5466, printed circa 1982. It's very muu-muu like, isn't it? We have had some really warm, glorious days here in Oakland and my mind has turned to light summer clothing. The problem with older patterns is that most of them only came in one size. 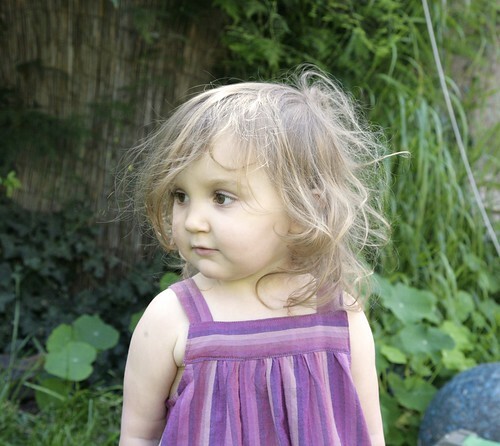 This is especially inconvenient for children's patterns because they grow so fast. 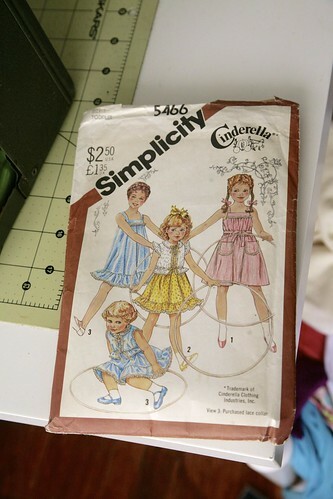 One of the reasons I chose to sew this pattern right now is that it's size 1 and I was worried that Maggie might grow out of it before I had a chance to sew it. I figured it would likely fit her fine width-wise, but I added a few inches extra length to the skirt because she's tall for size 12 months clothes. Well, I needn't have worried! I actually had to take the straps in a little bit to fit her! And it's almost ankle length! It definitely has a "flower child" look to it, doesn't it? It doesn't get much simpler than this pattern. I used self-bias to bind under the arms, and the straps attach on the inside with hidden buttons. 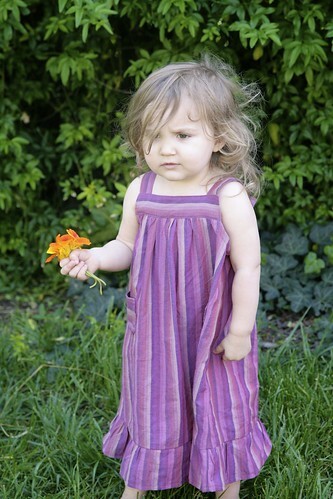 Construction wise, the pattern is similar to the Oliver + s Popover Sundress but it's gathered across the front and back instead of flat (which would be a really easy modification to that pattern, actually). I decided not to do the cinched waist and went with the muu-muu look on this version, but the cinched waist is simply an elastic channel on the dress with a little sash, very easy. Similarly, I opted not to do any trim, but this dress screams for some trimming. I was thinking to myself it would be really sweet in a plain light blue chambray with eyelet trim across the yoke and around the pockets (with a sash). Maggie is obsessed with picking flowers right now. 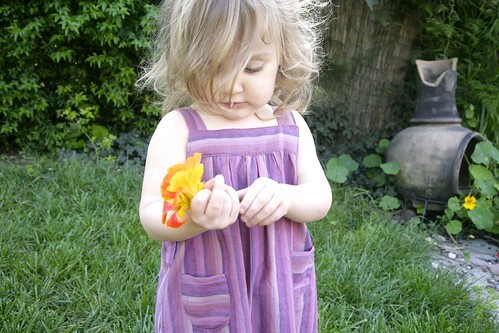 Every time we go outside, she runs to pick some oxalis (sourgrass), nasturtiums, salvia, or lavender flowers. 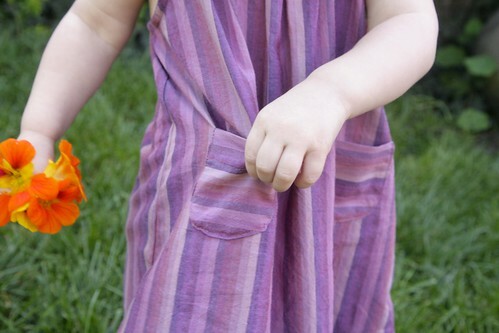 Then she clutches her little bouquet tightly until it literally falls apart in her hand, showing it to anyone who will listen, saying "Look! I have yellow (orange, blue, purple) flowers! Pretty flowers!" with earnest seriousness. 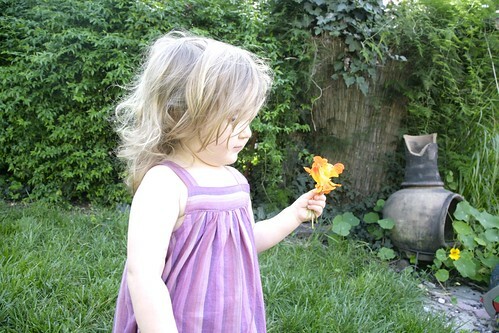 It is very sweet and keeps Maggie happily entertained while Steve and I pull weeds (including nasturtiums and oxalis!) and plan the garden. 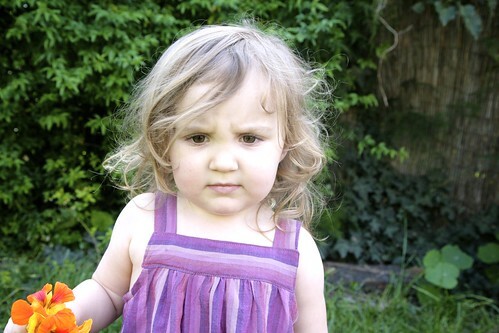 Of course, it is not as convenient when we're trying to get somewhere and Maggie insists on stopping to pick flowers. Or when she tries to do this in other people's gardens. 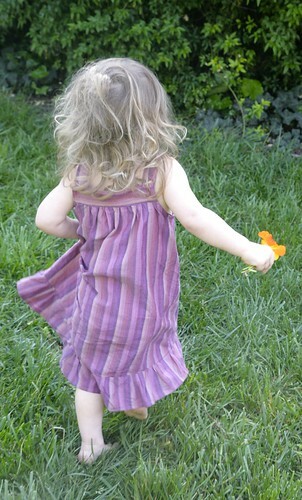 I try to steer her towards dandelions, oxalis, and other common weeds that most people don't want in their yards. But seeing Maggie walking down the sidewalk with a serious expression and a fist full of flowers is almost unbearably precious. This fabric is a lovely pink and purple irregular woven stripe. I could've sworn it was Kaffe Fassett, but I can't seem to find any links? It is a very soft and breezy (almost gauzy) shirting weight, easy to sew and the colors almost seem to glow. I put the pockets and the yoke on the cross grain for interest on an otherwise simple dress. Guess what Maggie put in her pocket? Well, okay, let's be honest here: actually, things were not quite as idyllic as they first appeared. Maggie was not feeling this photo shoot. She was having fun running around, and I was bugging her. She did not want to look at the camera and she definitely did not want to smile. When I tried to redirect her to look at me, I got a nice sampling of Maggie's characteristic furrowed brow and scowl. Finally, she threw me a bone with this shot. "You want me to look in the camera? FINE, here's my face, in the camera! Sheesh!" I got the message loud and clear. I didn't try again after that. The other day I was at the park with Joe and Maggie and my sister's kids, and Maggie determined that she would climb the highest curved/arched ladder, the one that leads to the tallest tower at the playground, in order to go down the tallest, scariest slide. Of course! So I was standing below her while she climbed, hopelessly attempting to spot her many feet above my head and trying not to have a panic attack, when I heard Maggie muttering to herself, "I go up. I go up. I go up," with each rung of the ladder she climbed, like the little engine that could! She may be small and love pink and flowers, but watch out for that core of steel. I love that dress! It looks so soft and comfortable. And it's not pink-- Maggie must be branching out a little bit! I love the fabric! The dress is perfect, too. Maggie looks adorable. 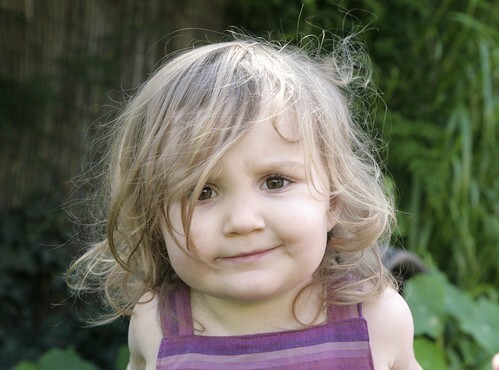 Oh she looks exactly like my daughter at that age with those expressions. You just got hit with a "death frown"! That's a cute dress. I always forget about the simple looking patterns but they can be cute. I can't handle her cheeks! Or her curls! Ok, I just can't handle Maggie's cuteness! I say it was for the best that you couldn't get M to smile because that expression is priceless! Love it! Also, the chambray + eyelet trim is inspired. You need to go for it. Need. I love your Pinterest pins. You have great taste! So cute, Inder!! That second to last picture is almost too cute for words! 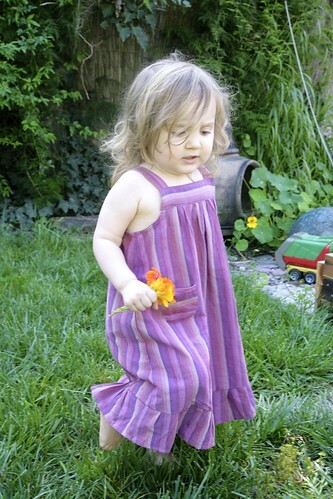 And that purple striped fabric is oh so lovely. I know E would love it. Does it wrinkle up like crazy out of the dryer? I'm always on the lookout for light fabrics that don't require a ton of ironing.